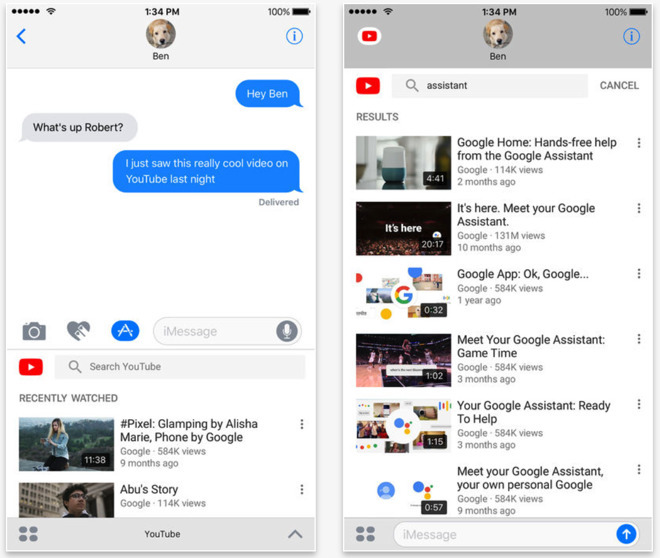 An update on Tuesday morning to the YouTube app brings video sharing and inline viewing to iMessage without recipients needing to leave the application. The new update alters the share button slightly, and adds Messages as a potential sharing target. Users then select the recipient, and a link to the video is shared. Once received, the video link can be tapped to play it without departing the app. A second tap enlarges the video to full screen. Initial AppleInsider examination of the feature shows slightly slower video transfer speed through iMessage than through the browser or native YouTube app. It is unclear specifically why —but the slower buffering did not interfere with the video presentation at all. Beyond bug fixes and the deeper Messages integration of video, there appears to be no additional features added to the app. Version 12.38 of the YouTube app requires iOS 9 or later, and has an Apple TV version. It requires 166Mb of device storage space.